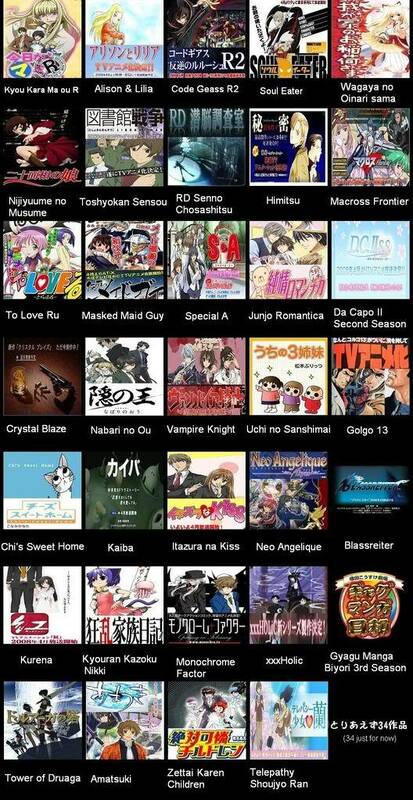 Here is a list of anime series that are coming out around April or so. Enjoy! I'll wait for a more in depth summary before committing to anything, though toshyokan sensou seems like the kind of absurd show I could go for from the cover (they're fighting war in a library?). The season doesn't appear to be shaping up very well. Everything is starting to mesh together and look the same. Nothing really catches my eye, but i guess thats why you watch the first episode of something and decide then. The only exception to that would be haruhi, because you can't just watch the first episode and decide. The whole first episode was a big wtf. well off of the list itself I know I'll be following Code Geass R2 and Da Capo 2 S.S. Beyond That I'll wait for Hashihime's blog to cover the series in detail. I'll bet all the CLAMP-lovers are fangasming over xxxholic right now. Either way, nothing looks terribly interesting, but at least it doesn't look unwatchable like the winter season did. I'll wait for previews and staff/casts before I pass any judgment on anything. Ryuuka wrote: I'll bet all the CLAMP-lovers are fangasming over xxxholic right now. Yeah, but at least during winter we had stuff to fall back on. Heres a link that gives descriptions of the anime series. I am really lookin forward to RD Sennou Chousashitsu. I'm really into those deeper, psychological animes. Not to mention, this reminds me of Ghost in the Shell a bit with the whole mind connected to the net thing (not to mention it's made by Production I.G., and I've never been disappointed by them). WildKard wrote: I am really lookin forward to RD Sennou Chousashitsu. I'm really into those deeper, psychological animes. Not to mention, this reminds me of Ghost in the Shell a bit with the whole mind connected to the net thing (not to mention it's made by Production I.G., and I've never been disappointed by them). So how much are you enjoying Ghost Hound? Anyone know when the next season of Suzumiya Haruhi no Yutsuu is coming out? LOVE IT. I love watching stuff that involves representations of the mind (btw, I'm a psychology major if that explains things, lol). So watching how each character deals with their stress and how it affects their mental state is very interesting for me. Okay, starting to sound like a psych geek and I'm also going off the forum topic so I better stop, lol! Yeah it is a great show, at first I didn't think I'd like it but I hung on cause it was Production I.G. and I'm glad I didn't drop it, of course if you showed it at JMS it would probably drop faster than La Corda seems to be at the moment. Oh and lastly grats to Production I.G. to making a show that flares my subwoofer up to ridiculous levels during the eps. Any one know exactly when Code Geass R2 comes out? April 6th for Geass 2. I don't know how many people read Random Curiosity here, but they put up a primer for R2 a while ago. I'm definitely going to watch Allison and Lilia, though, mostly because I enjoyed Kino and also Madhouse is doing it. Production IG and Gonzo are doing a lot this season though (and KyoAni isn't doing a thing). If I had to guess, I'd say that KyoAni is already secretly hard at work on Haruhi season 2. Ok... now that I took the time to read through some reviews on blogs the only ones I plan no checking out are: Kure-nai, Itazura na Kiss, Kanokon, The King of Nabari, Special A (ugh Gonzo, but I'm reaching deep for entertainment), Himitsu ~Top Secret~ The Revelation, Real Drive. For sure without a doubt I'll be watching Code Geass 2 and Da Capo 2 S.S. I really hope something turns out good.